Alcoa is the world leader in the production and management of primary aluminum, fabricated aluminum, and alumina combined, through its active and growing participation in all major aspects of the industry: technology, mining, refining, smelting, fabricating, and recycling. Alcoa’s Power and Propulsion business unit launched a new service award program in 2011 to honor their employees for every 5 years of employment. When an employee reaches a 5 year milestone, they are rewarded with a $10 prepaid card for each year of employment. 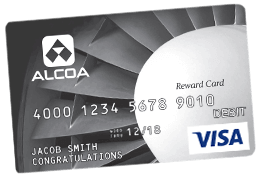 An employee with 10 years of service is presented with a $100 card branded with the Alcoa logo. Typically, the employee’s location holds a meeting to recognize these individuals along with their fellow colleagues for their commitment and present them with a certificate and this reward. Alcoa’s Power and Propulsion business unit previously used a program for employee rewards where employees selected items out of a catalog at each employment level. Recipients and HR were frustrated with this program because many times products were out of stock, discontinued or took weeks to arrive. OmniCard provided them with a simple program to reward each employee with a prepaid rewards card that can be used anywhere. Employees were extremely receptive to this new program and during transition many employees opted to wait for the prepaid cards instead of using the catalog offers.